In Search of that extra dimension in Architectural Lighting. Certain interiors demand that something extra. This is especially true for a contemporary styled interior where the minimalist look can sometimes look somewhat bare and plain. It is certainly good to have some striking black and white floor tiles with some plain black soft furnishings complemented by some blinds with clean sleek lines. However, without elegant lighting the whole effect can be lost. There has been a phase of using strategic spot lights for the desired lighting scheme and this can be effective from an illumination perspective but the lights themselves have no aesthetic beauty. It is often good to enhance the back lighting with a striking centrepiece Chandelier that will catch the eye of all who enter. If you have a traditional property typically of the Victorian or Georgian period and you are enhancing the interior design to give it that edge then you do not have to go for a the traditional chandelier . Whilst recognising that this is the safe bet and that this will give your property some real traditional character then if you do want to be more adventurous then it is quite acceptable to select a design with a more modern edge. This chandelier has the traditional chandelier design with flowing glass arms and handing pear shaded crystal trimmings but the use of black glass throughout the whole design make the look simply striking. To add to this the large marea plated crystals which have been incorporated by the Preciosca designer make this chandelier stand out from the crowd. It is these subtle additions and the combination of the Maria Thereasa design which has the glass cased arms and the brilliance of the marea plated crystals which emphasise why the Preciosa designers are recognised for their excellence across the industry. 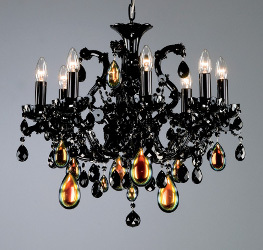 If the look of this chandelier is still too modern then there are more traditional chandelier options which simply take the traditional designs and simply styalise throught the use of the jet black colour ornamentation so to see more talke a browse through our black chandelier selection. Should your property be more contemporary then you will typically want to steer well clear of the traditional chandelier unless of course you are going for the option of mixing the old and the new. This strategy is often well used but in this case we will assume that for a modern look you need a contemporary chandelier. 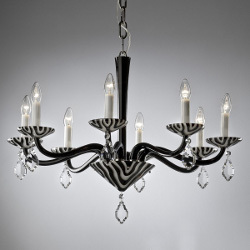 The black chandelier shown here is another fine piece of design work from Preciosca and shows how the use of the black and white stripe is not just the reserve of nature and the zebra but can be very effectively used in interior design. This clean sweeping arms and simplistically designed candle trays are all part of the look and the combination is chosen to create an image of modern elegance but one that is memorable and will certainly be the deserving centrepiece for any new space.